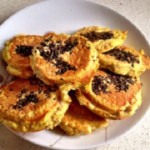 SAVOURY HIGH-PROTEIN QUINOA PANCAKESLooking for new breakfast ideas? You’ll love these savoury pancakes. Not only easy to make, but also very versatile. You can add any ingredient you like. You can even use them as a substitute for burger buns! Just whack a patty between two pancakes, add lettuce, tomato, onion and my healthy Aioli, voila low-carb burger! Using a food processor, blend all ingredients except the quiona together until completely smooth. Mixture will look just like a pancake batter. A large tablespoonful of the mixture on a hot greased skillet and press down gently like a pancake. Sprinkle quinoa on top. Cook for about 1 minute then flip to the other side. This entry was posted in Healthy Eating, Recipe Ideas, Uncategorized and tagged protein, quinoa, snacks. Bookmark the permalink. ← Still throwing your egg yolks away – wake -up!